Abstract — Prostheses are prescribed to restore the mobility of people with amputated lower limbs. Monitoring the prosthesis wearing times and physical activity of prosthesis users would provide invaluable information regarding rehabilitation progress and suitability of the prosthesis. The validation of a method to determine wearing times and physical activity state, as well as strides taken, of amputees wearing suction suspension sockets is reported. Eight participants with transtibial amputation were fitted with custom-made suction sockets. Analysis algorithms were used to automatically characterize physical activity based on the pressure at the socket’s relief valve. The algorithms were validated in a laboratory-based protocol that included walking, stair climbing, standing, sitting, donning, and doffing. Intraclass correlation coefficient (2,1) values of >0.98 were achieved with mean differences of –2.0%, 0.3%, 1.3%, and 0.7% for agreement between "off," "static," and "dynamic" times and stride count, respectively, as determined by the analysis algorithms and a concurrent video analysis. 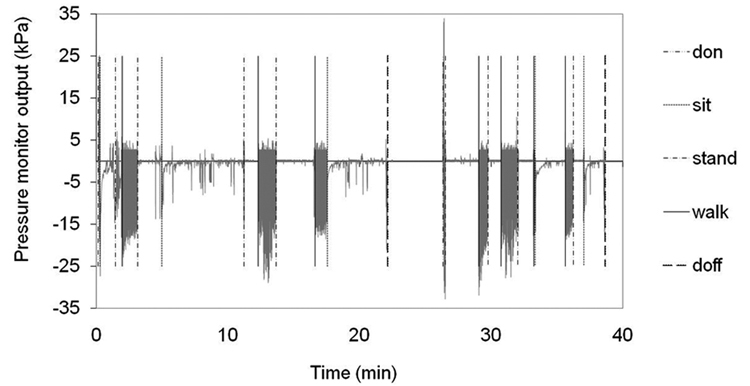 This study demonstrates that an interpretation of the pressure at the pressure-relief valve of suction suspension sockets can be used to determine wearing times and activity state. Key words: activity monitor, doff time, physical activity characterization, pressure monitoring, prosthesis wearing times, rehabilitation, residual limb, stepping, suction suspension socket, transtibial amputee. Abbreviations: EPSRC = Engineering and Physical Sciences Research Council, ICC = intraclass correlation coefficient, RMSE = root mean square error, SD = standard deviation. *Address all correspondence to Benedict William Stansfield, PhD; School of Health and Life Sciences, Glasgow Caledonian University, Cowcaddens Rd, Glasgow, United Kingdom G4 0BA; 0141-2731551; fax: 0141-3318112. Prosthetic devices are used to restore the mobility of people with amputated lower limbs. One of the major goals of rehabilitation for people with lower-limb amputation is fostering a rapid return to activities of daily living, including self-ambulation. To achieve this goal, a comfortable, effective, and easy-to-use prosthesis is essential. The degree of mobility of the person with amputation may depend on the level of amputation, condition of the residual limb, general medical health, and the person’s motivation [1–3]. Observation and gait analysis can be carried out in a laboratory environment to determine gait quality and inform the process of prosthesis fitting . This analysis does not, however, provide evidence of the activity level of the person with amputation outside the laboratory or information on the daily usage of the prosthesis. Information concerning rehabilitation progress, prosthesis comfort, and amputee motivation could be gained if free-living use of the prosthesis could be quantified. Although questionnaires provide useful data [5–7], the information obtained is subjective. The use of worn monitors provides the opportunity to collect objective, quantitative data on the amputee’s activity with no recall bias. Small commercial devices are available for multiday activity monitoring in the free-living environment [8–13]. While monitoring of stepping activity has been achieved using a number of devices (e.g., foot switches , pedometers ), accelerometers offer the opportunity to gather extended data on movement patterns because of their small size and low power consumption. Objective data collected using accelerometer-based systems, such as the StepWatch Activity Monitor (Orthocare Innovations; Oklahoma City, Oklahoma), have demonstrated high levels of accuracy in detecting purposeful stepping  and have also confirmed the relatively poor quality of information gathered from questionnaires . The use of multiple sensors within an accelerometer-based system can provide extensive additional subclassification of activities [8,17]. While this information might be valuable, single-sensor systems are often advocated to minimize inconvenience to the wearer. Accelerometer-based devices, such as the Patient Activity Monitor (Össur; Reykjavik, Iceland), provide such a solution with proven ability to measure stepping [15,18–19]. These monitoring solutions allow the collection of physical activity information and can also provide an indication of sedentary times. It is difficult to be certain, however, that wearing times can be accurately monitored using accelerometers. Wearing of the prosthesis may not be associated with prosthesis movement, and therefore, no signal change would be recorded. Ideally, a device would record both activity and wearing times, be integrated with the prosthesis, and not require any input from the wearer to facilitate data collection. One possibility for quantifying physical activity and wearing times is to develop suitable interpretation of the residual limb-socket interface pressure. Changes in interface pressure with prosthetic alignment [20–21], activity type , time of day , change in limb components , wedging , and dependence on individual prosthesis fit  have all been demonstrated. This evidence suggests that pressure measurement could provide the information necessary to determine the activity being undertaken, allowing discrimination between different movement patterns. Importantly, analysis of the pressure could also allow determination of wearing times. Measurement of the pressure has been accomplished by numerous research groups [20–29]. However, direct measurement at the residual limb-socket interface requires socket modification and may lead to interference between the socket and residual limb. The implementation of such methods would be costly and potentially lead to reduced wearing times as a result of interference with the residual limb. Suction suspension sockets offer the alternative of monitoring the pressure in the distal pressure-relief valve rather than directly at the interface. On donning, air is expelled through the distal one-way pressure-relief valve that then seals to provide a negative pressure (relative to atmospheric) to support the prosthesis on the residual limb during periods of unloading. The pressure between the socket and the residual limb will vary depending on the wearer’s activity. One can hypothesize that measuring the pressure at the valve will provide information on prosthesis wearing times, participant posture (sitting or standing) and, by examining variations in the signal, number of steps taken. The aim of this study was to validate a method to quantify amputee’s prosthesis wearing times, walking times, and stride count. To do this, we recorded the pressure signal at the valves of suction suspension sockets and used custom-written analysis programs to quantify relevant physical activity characteristics from this pressure profile. The study was conducted indoors at the Bioengineering Unit, University of Strathclyde, Glasgow, United Kingdom. Eight unilateral transtibial amputees aged 32–71 (mean age 55 yr) were recruited (Table 1). All participants were able to walk independently, although one used a walking stick for support during walking. Suction sockets were custom made by the same prosthetist for all individuals. Each suction suspension socket was fabricated following standard procedures with a one-way pressure-relief valve fitted in a distal location. A suspension sleeve or silicone "Seal In Liner" (Össur U.K.; Manchester, United Kingdom) was used to create a seal between the limb and the prosthesis. Alignments and other adjustments were carried out until the participant was comfortable walking with the prosthesis. Collection of data did not begin until the participant was content with the prosthesis fit and after a period of familiarization (5–15 min) walking in the laboratory. To achieve the aim of this work, using a custom-made device to record pressure was necessary. While the device used provides an example of a possible solution for recording the pressure signal to achieve multiday recording of the data, optimization of device hardware was not an aim of the reported work. Pressure at the pressure-relief valve was recorded at a frequency of 10 Hz by using a monitor consisting of a piezoresistive pressure transducer (24PC Series, RS Components; Corby, Northants, United Kingdom; range ±100 kPa ) and the data collection and storage elements of an activPAL (PAL Technologies Limited; Glasgow, United Kingdom; software version 5.8.1.6). The data collection unit had the capacity to record continuously for 8 d. The data storage unit has a hardware anti-aliasing filter to prevent high frequency noise from affecting the signal. This limited the measured signal to the 0–5 Hz range. The monitor was mounted on the outside of the prosthesis and attached to the socket’s pressure-relief valve (Figure 1). The monitor had a total weight of approximately 30 g with dimensions of 50 × 50 × 7 mm. The output of the monitor was calibrated to pressure and demonstrated an excellent linear fit (pressure relative to atmospheric [kPa] = 0.4853 × pressure monitor output – 59.43 [R2 = 0.998]). No drift was evident in the signal, indicative of no leakage within the components of the equipment. Pressure monitor showing attachment to suction suspension socket pressure-relief valve with customized adaption. Participants performed a series of activities. First, they donned the prosthesis. This was followed by sitting, standing, walking on level ground, ascending stairs, descending stairs, and doffing the prosthesis. Movement was unconstrained between specified activities, resulting in varying amounts of activity in the different states and variations in stride count among participants. All activities were conducted at the preferred speed of the participant, with rests allowed between activities. Testing sessions lasted approximately 1 h.
Prosthesis "on" or "off": If there was no contact between residual limb and prosthesis, then a state of off was recorded. At other times, the socket was considered to be on. "Static" and "dynamic" states: If the participant was wearing the prosthesis but not stepping, then he or she was considered to be in a static state (sedentary, sitting/lying or quiet upright posture). If the participant was stepping, then he or she was considered to be in a dynamic state. "Stride": A stride was defined as the forward progression of the amputated limb from one foot strike to the next foot strike. Stair ascent and descent were classed as stepping activity in the same way as level walking. We synchronized the signal from the pressure monitor to the video record by ensuring that, at both start and stop times, the pressure monitor was within the view of the video recorder. The repeatable signal components of the relief valve pressure (Figure 2) were used to design data analysis algorithms to interpret activity patterns and, hence, automatically categorize activity and count strides. No repeatable distinction in pressure signal was found between quiet standing and sitting. Therefore, we could not classify activity into these subcategories but instead defined a category of static, in which the participant was not stepping but was wearing the prosthesis. Therefore, the data analysis algorithms (Figure 3) developed in MATLAB (MathWorks Ltd; Cambridge, United Kingdom) classified activities into three categories: an off state when the prosthesis was not worn, a static state, and a dynamic state. Additionally, strides were counted. The off state was defined as when the signal was equivalent to constant atmospheric pressure for longer than 2 min. Typical example of pressure profile recorded during activities. Atmospheric pressure = 0 kPa. Different postures (sitting and standing), walking, and don/doff times as determined from video analysis are indicated in legend. Note that pressure returns to atmospheric following period of walking, but with participant still upright (standing). 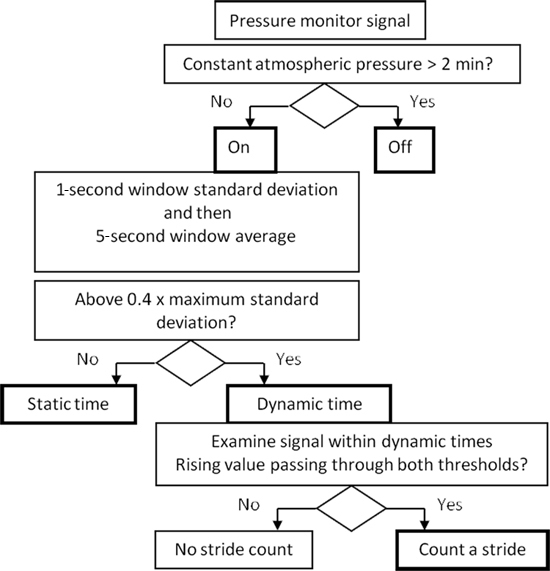 Flowchart of signal analysis for determining activity state and stepping. To identify dynamic times, a 1 s (10-sample) standard deviation (SD) moving window was calculated across the signal. This was then passed through a 5 s average moving window. Dynamic times were defined as those that had a resulting average SD of greater than 0.4 times the maximum value across the individual’s entire data set (Figure 4). All other on times were classified as static. Example of 1 s moving average standard deviation pressure signal (gray) and 5 s moving average of this signal (black) (original pressure signal consistent with previous figures). Threshold (gray) of 5 s moving average signal (0.4 × maximum value) is shown to distinguish static and dynamic events. Events are marked as determined from video analysis. Within the dynamic times, a stride was counted each time the raw signal increased through two thresholds (–6.05 and –0.71 kPa) (Figure 5). These thresholds were selected based on observation of signal output for definite periods of purposeful stepping across all participants. Example of cyclical signals representing walking (gray line: original pressure signal consistent with previous figures). Dynamic state was defined when 5 s window average (thick black line) passed through dynamic threshold (thin gray line). Stride was counted (black square) when signal increased throughboth thresholds (–6.05 kPa short-dash line and –0.71 kPa long-dash line). 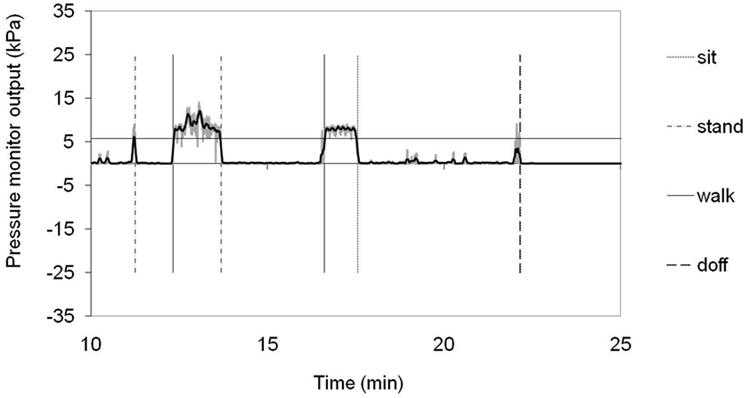 Start of walking episode is indicated by vertical lines: solid line for video-based analysis and dashed line for pressure-derived analysis. The intraclass correlation coefficient (ICC) (2,1) was calculated between the pressure monitor-derived and video-based observation results. In the context of measurement of step counting and activity with wearable devices, an ICC value of ≥0.85 was considered to be reasonable, ≥0.95 good, and ≥0.98 excellent. Agreement between video and pressure monitor analysis was assessed [30–31] using the following percentage difference: Percentage difference = 100 percent × (P – V)/V, where P = pressure-derived value and V = video-based value. The limits of agreement were determined as ±2 SD of the difference. Root mean square error (RMSE) was calculated to allow comparison of the two data sets in terms of absolute units. For each participant, the total time spent in each activity state and the total number of strides taken were established from interpretation of both the pressure monitor output and the video record (Table 2). As characterized from the video-based analysis, off, static, and dynamic times ranged from 131 to 860 s, 1,109 to 2,555 s, and 356 to 890 s, respectively, and the number of strides taken ranged from 241 to 552. For individual participants, differences in outcomes ranged from –6.4 to 3.6 percent, –2.5 to 2.8 percent, –8.5 to 9.6 percent, and –2.2 to 4.1 percent for off, static, and dynamic times and stride count, respectively. The calculated ICC(2,1) values were 0.998, 0.998, 0.987, and 0.996 for off, static, and dynamic times and stride count, respectively. Upper and lower limits of agreement are given in Table 2. A maximum mean difference of 2.0 percent was seen for off time, such that the monitor-derived results were less than the video-based results. The maximum spread of limits of agreement was found for dynamic time (–10.6% to 13.2%). Figure 6 shows the distribution of percentage differences by value of the video-based data. RMSE was highest for static time at 31 s (Table 2). Total time in each state and stride count for video analysis-based values (V) and pressure monitor-derived values (P). Percentage difference (Diff %) = 100 × (P – V)/(V)) with upper and lower limits of agreement (ULA [mean + 2 SD] and LLA [mean – 2 SD], respectively) and root mean square error (RMSE) are given. Agreement plots of (a) "off", (b) "static," and (c) "dynamic" states and (d) stride counts. 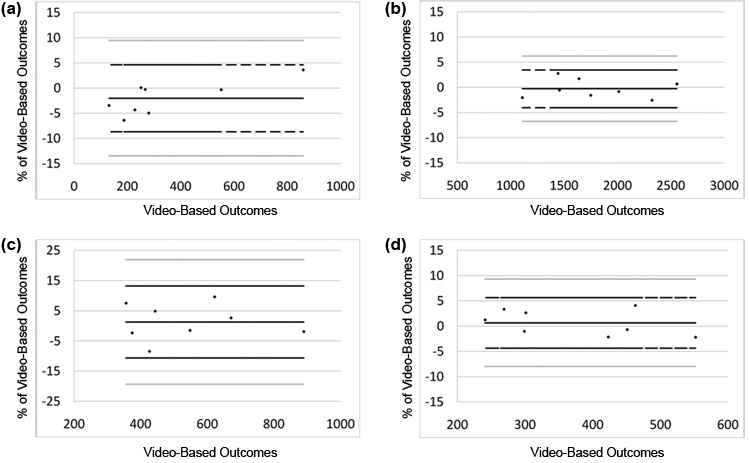 Difference between pressure monitor-derived and video-based outcomes is presented as percentage of video-based outcomes (y-axis) plotted against video-based outcomes(x-axis). Mean (solid black) and limits of agreement (±2 standard deviation) (black dashed) are given with upper and lower 95 percent confidence intervals of limits of agreement (gray). Methods of characterizing the physical activity of people with transtibial amputation have been proposed before. Step counting is well established with excellent accuracy of >98 percent for purposeful stepping above a minimum speed [13,15,18–19]. Multiple sensors have been proven to enhance the range of activities that can be accurately characterized [8,10]. While these methods can reliably determine stepping profile, the determination of wearing time is more challenging using a minimal sensor set. Evidence in the literature has demonstrated that localized pressures within the socket vary substantially with movement and, therefore, might be used to determine activity type and stepping [20–26]. In addition, because the pressure measured is related to socket-residual limb movement, one might expect that a measure of wearing times could be determined from this pressure. The current study presents the results of attempts to establish the validity of an algorithm to determine both activity type and wearing times from the pressure at the pressure-relief valves of suction suspension sockets. The algorithms were tested on a group of people with transtibial amputation during sitting, standing, and walking both on level ground and up and down stairs. Suction suspension sockets are designed to provide a secure socket attachment to the residual limb without cumbersome straps. A "seal" is used to prevent air entering the gap between the socket and residual limb. The pressure profiles recorded in this study indicated that although the seal was sufficient to maintain the socket on the residual limb during walking, it was not "air tight" because the pressure at the valve reduced to atmospheric even when the participant was standing. The distally located pressure-relief valve had an open connection to the socket-residual limb interface. It was not clear whether the pressure being measured was characteristic of only a very local value or more generalizable to the residual limb-socket interface. It was also not possible to gain insight into changes in distribution of air at the interface or to determine deformation of soft tissue structures. These phenomena may have affected the measured pressure during both dynamic and static events. Even with an uncertain understanding of the mechanism of pressure generation at the pressure-relief valve, we were able to use changes in the pressure signal to divide wearing times into static and dynamic states and to measure strides. ICC(2,1) values of >0.98 demonstrated the excellent overall ability of the pressure analysis algorithm to identify state and stride count. Further analysis of the results by using the limits of agreement revealed that the spread of differences between the video-based classification and pressure-derived analysis algorithm was within ±13.2 percent, with a maximum mean offset of 2.0 percent for off events. The signal analysis algorithm was implemented automatically to extract information from all participants’ data. Insight into the effectiveness of the analysis algorithms was gained by examining the two records of physical activity classification alongside one another. A prosthesis may be worn but not be moving. Under this condition, accelerometer-based devices would register no signal and, therefore, may interpret the condition as off. To overcome this potential difficulty, the current study monitored pressure at the pressure-relief valve, hypothesizing that even for sedentary periods (sitting), small pressure changes would occur. The results indicated that this method of detecting the off state worked well for the protocol used. Examination is needed of the signal recorded during activities, such as sleep, during which movement would be infrequent and small. Although quiet sitting was measured during the current study, sleep was not. The off component of the algorithm used the assumption that no off period in free-living would be less than 2 min. For the evaluation study, all off periods were intentionally made longer than 2 min to test the algorithm’s ability to correctly detect them. The off state was associated with a record of constant atmospheric pressure. 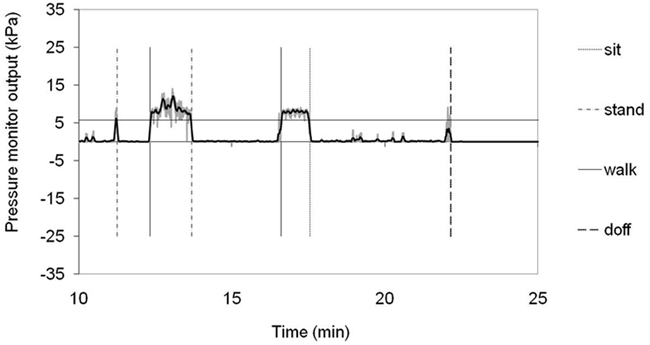 Some misdetection occurred at the beginning of the off states as a result of minor pressure fluctuations, perhaps indicating that the pressure monitor did exhibit very small levels of drift when unloaded rapidly. Reduction of the minimum off duration could have allowed shorter off periods to be identified, although the relative error in duration may have increased. The implemented algorithms did not make distinguishing sitting from quiet standing possible because the signal decayed to atmospheric pressure in both the quiet standing and sitting postures. The signal decay was not consistent for either walking to sitting or walking to quiet standing changes. The decay depended on the precise sequence of movements before the sitting posture was adopted. Dynamic activity was determined based on the SD of the signal. We had to select a suitable cutoff to determine whether the participant was in the dynamic or static state. In a few instances, a dynamic state was incorrectly determined because the participant was moving the residual limb within the socket and causing pressure variation sufficient to pass the dynamic threshold. The excellent correlation and agreement results indicate that this occurred on only a small number of occasions. The use of 0.4 SD as a threshold for dynamic activity was determined based on the data collected from the subjects studied. The data collected were for only a selection of movement patterns and postures. In free-living conditions, individuals might record prolonged periods of large pressure variation within the socket. This aspect of the analysis algorithm would have to be tested on extensive free-living data. 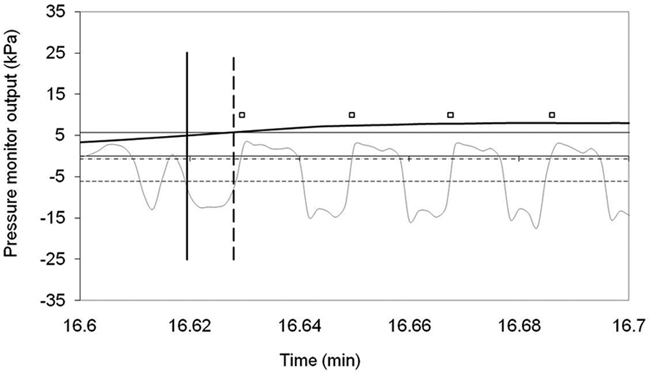 The identification of strides within the recorded pressure signal was accomplished by the use of a double threshold method in which the raw signal had to pass through both thresholds to register a stride. This method of stride detection worked very well, with excellent correlation and agreement between measurement methods. Motion of the residual limb in the socket during standing occasionally resulted in overcounting, and slow or short strides sometimes were not counted. The algorithm was just as successful in detecting strides taken up and down stairs as on level ground. No attempt was made within the algorithm to distinguish between stair and flat strides. For free-living activity and sedentary behavior to be fully characterized, a number of other actions should be studied. It is difficult to predict how the following activities would be characterized under the algorithm: very slow ambulation (shuffling); very fast ambulation (running); sleeping (recorded as static or off? ); walking with assistive devices; cycling; and different types of walking surfaces, including slopes. We would advise that an extension of the work reported here cover activities undertaken by any study population within a free-living context. Because the residual limb of each individual is different, we cannot say whether the signals developed at the valve for all people with transtibial amputation would be similar to those reported here. Therefore, performing a standardized test on each individual for whom this type of monitoring solution is to be used is advisable. In light of changes to the residual limb over time , stability of the output across extended time periods (months) should also be considered. Ideally, evaluation of the algorithms would have used data collected in a free-living environment and would, therefore, have included examples of all movement patterns undertaken by the participants. This method of experimentation is, however, extremely time consuming and therefore impractical to implement. The signal processing methods validated here allowed for a fast, automatic analysis of the pressure data stream. Alternative approaches may be made and have been advocated; for example, the use of algorithm training trials in which a participant performs a specified activity to provide a calibration signal for use in subsequent analysis. Alternative methods for signal analysis are available, such as pattern recognition (e.g., utilizing information on sequencing of activity states to ensure validity of posture transitions) or wavelet analysis (e.g., using the signature acceleration waveform to detect stepping) [32–33]. However, because the signals recorded did not contain characteristics that allowed the extension of classification beyond off, static, dynamic, and stepping, using these more computationally intensive techniques was not justified. The small differences in classification between the monitor and video analyses determined in this study demonstrate the suitability of the algorithms used and provide confidence in the relevance of data derived using the methods advocated. We demonstrated that by monitoring the pressure at the pressure-relief valve of a suction suspension socket, physical activity can be classified successfully into off, dynamic, and static states and strides can be counted. To accomplish this, a generally applicable algorithm was developed that required no participant-specific calibration. This type of monitoring solution offers the potential to allow quantification of multiple days of prosthetic use and user activity in their free-living environments. The method demonstrated is associated with no interference with prosthesis fit and requires minimal patient or clinician input. Thus, acquisition of free-living physical activity data are made possible without the subjective error of questionnaire reporting. Acquisition of data: K. T. Tang, W. D. Spence. Drafting of manuscript: K. T. Tang, W. D. Spence, B. W. Stansfield. K. T. Tang, W. D. Spence, D. Maxwell, B. W. Stansfield. Obtained funding: B. W. Stansfield. Administrative, technical, or material support: K. T. Tang, W. D. Spence, D. Maxwell, B. W. Stansfield. Study supervision: W. D. Spence, D. Maxwell, B. W. Stansfield. Financial Disclosures: D. Maxwell is an employee of PAL Technologies Ltd, which manufactures and sells activity monitoring solutions. The pressure monitors used in this study are not commercially available. D. Maxwell was the industrial supervisor for K. T. Tang’s Engineering Doctorate studies. No payments were made for this study to the University of Strathclyde or to any of the academic authors or participants by PAL Technologies Ltd. The funding body, the Engineering and Physical Sciences Research Council (EPSRC), had no direct input to this work. B. W. Stansfield currently holds an EPSRC-funded CASE award in collaboration with PAL Technologies Ltd. No payments will be made to B. W. Stansfield as part of this study. Funding/Support: This material was based on work supported by an Engineering Doctorate grant to K. T. Tang from the UK EPSRC as part of the Medical Devices Doctoral Training Centre at the University of Strathclyde. Additional Contributions: The authors would like to thank all participants for their enthusiastic participation in this study. Funding from the UK EPSRC in terms of a Doctoral training grant for K. T. Tang allowed this work to be completed. This study would not have been possible without the supply, free of charge, of pressure monitors from PAL Technologies Ltd.
Institutional Review: Ethical approval was gained from the University Ethics Committee and consent was obtained from all participants. Holden JM, Fernie GR. Extent of artificial limb use following rehabilitation. J Orthop Res. 1987;5(4):562–68. Pernot HF, De Witte LP, Lindeman E, Cluitmans J. Daily functioning of the lower extremity amputee: An overview of the literature. Clin Rehabil. 1997;11(2):93–106. Day HJ. The assessment and description of amputee activity. Prosthet Orthot Int. 1981;5(1):23–28. Rommers GM, Vos LD, Groothoff JW, Eisma WH. Mobility of people with lower limb amputations: Scales and questionnaires: A review. Clin Rehabil. 2001;15(1):92–102. Bussmann HB, Reuvekamp PJ, Veltink PH, Martens WL, Stam HJ. Validity and reliability of measurements obtained with an "activity monitor" in people with and without a transtibial amputation. Phys Ther. 1998;78(9):989–98. Holden J, Fernie GR, Soto M. An assessment of a system to monitor the activity of patients in a rehabilitation programme. Prosthet Orthot Int. 1979;3(2):99–102. Bussmann JB, Martens WL, Tulen JH, Schasfoort FC, Van den Berg-Emons HJ, Stam HJ. Measuring daily behavior using ambulatory accelerometry: The Activity Monitor. Behav Res Methods Instrum Comput. 2001;33(3):349–56. Jia X, Suo S, Meng F, Wang R. Effects of alignment on interface pressure for transtibial amputee during walking. Disabil Rehabil Assist Technol. 2008;3(6):339–43. Sanders JE, Bell DM, Okumura RM, Dralle AJ. Effects of alignment changes on stance phase pressures and shear stresses on transtibial amputees: Measurements from 13 transducer sites. IEEE Trans Rehabil Eng. 1998;6(1):21–31. Dou P, Jia X, Suo S, Wang R, Zhang M. Pressure distribution at the stump/socket interface in transtibial amputees during walking on stairs, slope and non-flat road. Clin Biomech (Bristol, Avon). 2006;21(10):1067–73. Submitted for publication December 22, 2010. Accepted in revised form September 1, 2011. Tang KT, Spence WD, Maxwell D, Stansfield BW. 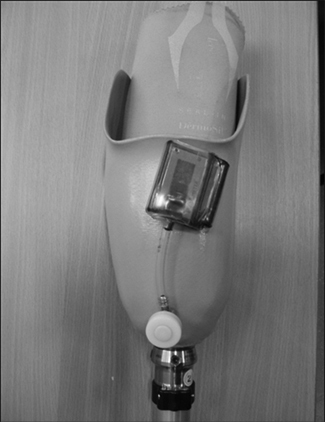 Validity of method to quantify transtibial amputees’ free-living prosthetic wearing times and physical activity levels when using suction suspension sockets. J Rehabil Res Dev. 2012;49(3):427–38.